Around 400 Wood Group employees are participating in industrial action on Shell platforms. Hundreds of oil workers are participating in the first North Sea strike in a generation. 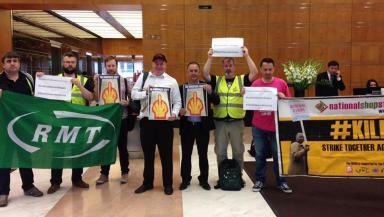 Around 400 Wood Group employees on Shell platforms downed tools at 6.30am on Tuesday. Members of both the Unite and RMT unions are taking part in the strike, which is the first of its kind in 28 years. They are unhappy about plans for further pay cuts and a recent switch to a three-week working cycle. John Boland, Unite regional officer, said: "This dispute is the first in the North Sea in three decades and shows the strength of feeling of our members who feel backed into a corner and left with no other option. "For decades, oil and gas companies across the North Sea have made hay while the sun shone and become very profitable on the back of the hard work and dedication of our members. "Now the weather has turned for the industry, they are using the downturn to attack the pay, terms and conditions of our members." The strike is set to last for 24 hours with further stoppages planned in the coming weeks. 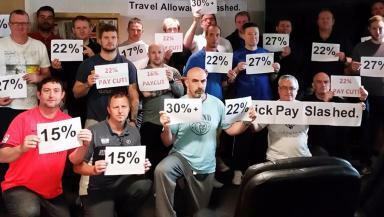 RMT general secretary Mick Cash said: "After savage redundancies and attacks on workload and working conditions this group of offshore workers are now told that they are going to be railroaded into accepting pay cuts of up to 30%. "They have voted overwhelmingly to reject this assault on their livelihoods and from 6.30am the strike action begins. "We are well aware that the company chief executive has had a pay increase of 28% to bring him up to £600,000. It is obscene that while the top bosses are lining their own pockets they are kicking the workforce from pillar to post." In February, Wood Group announced it was cutting rates paid to about a third of its contractors in the UK. It blamed the "continuing cost and efficiency challenges affecting the North Sea oil and gas sector". Aberdeen-based firm provides maintenance and construction to Shell and signed a three-year extension to its contract earlier this year. A Shell spokesman said: "This action is highly regrettable. Shell's priority is to ensure the safety of our workforce and assets and we will not compromise on safety during this period of industrial action. 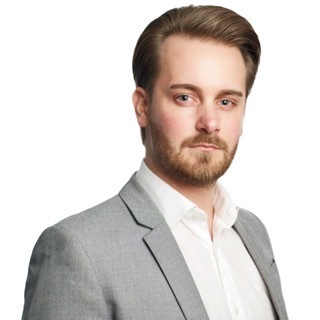 "While we recognise the right of Wood Group's employees to strike, it is clear that in order for the North Sea oil and gas industry to remain competitive in the lower oil price environment, structural change is needed. "We hope that Wood Group's employees and management will continue working towards reaching a solution which will halt this counter-productive industrial action." Production on the seven platforms involved is not expected to be affected, Shell added. Production on the seven Shell platforms involved is not expected to be affected, Shell added.